When shopping for clothes, what draws you over to a rack and causes you to start flipping through the hangers? Well, besides dresses and jeans.... for me? It's a good lot of stripes. I'm not into geometric prints or animal prints... Solids are alright in moderation. And the flower print needs to be just right. But stripes are the things that draw me in again and again. I'm a wee bit sheepish about sharing this picture of my stripes packed closet with you. But it's just so shocking and hilarious, that I thought, "Why not?" 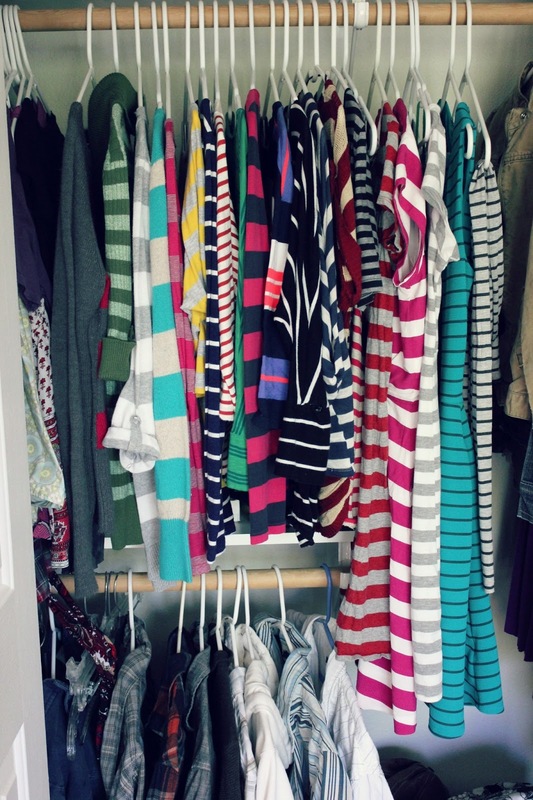 I didn't realize just how many shirts, dresses, and sweaters I own that are striped until I saw THIS and realized I'm in a tiny bit of a rut. At least I'm not in a color rut, right? I see quite a variety in there. I do own more than striped things, but I'm thinking this collection takes up 2/3 of my closet space. And I lined them up just for you, so it doesn't always look this insanely striped in there... but I'll have to admit, it made me really happy to see them all together. Like long lost cousins back for a family reunion. So if my sister (who tried to break me of my fashion rut) is reading this... Jen, you can take the stripes off the girl, but you can't take 'em out of her. Now it's your turn: What sort of fashion rut do you find yourself in? 3 comments on "closet confessional"
I love stripes too! I am starting to have a thing for tunics, a little behind the crowd. I also love bright pink, and... I have to confess, and Amanda I think it may even be your fault, I am into Converse. Since the conference when I saw you sporting them so nicely, I have gotten three pair! Albeit, one pair I got on clearance, and the other two at a thrift store. I love the stripe collection! Stripes are in for sure!!! Keep wearing them, they look great on you! I only wish I could wear them as well as you do. Thanks for sharing.